A youthful sea-god--probably Triton but perhaps Palaemon or one of the more obscure gods--guides a Hippocamp (fish-tailed horse) on a rein. 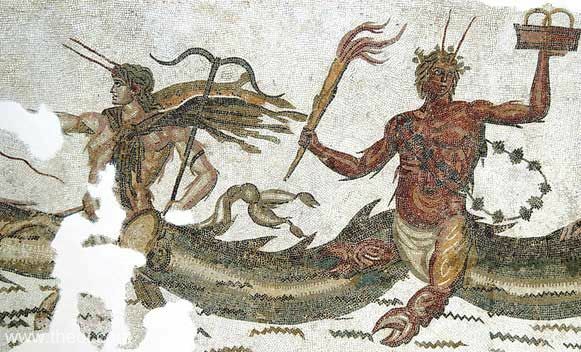 The sea-god is portrayed as an Ichthyocentaur (marine centaur) with the upper body of a man, the tail of a fish, the forelegs of a horse, and a pair of lobster horns. He wears a fish-skin cape and holds an anchor in his hand. He is accompanied by a red-skinned sea-god with the tail of a fish, lobster-claw forelegs and lobster horns. This deity wears a wreath of seaweed and holds a box and flaming torch in his hands. The figure is most likely Phorcys.